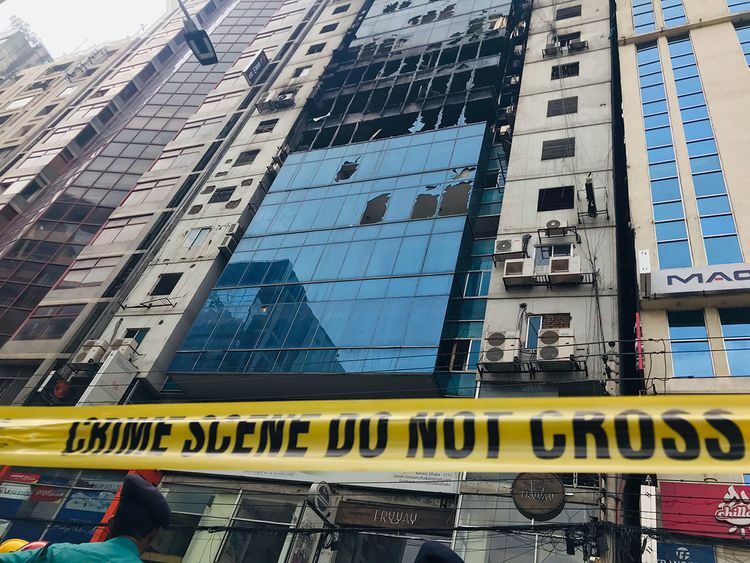 Dhaka: Police in Bangladesh said Sunday they had arrested the owners of an office tower in Dhaka that caught fire earlier this week, killing 26 people and renewing the country's debate over lax safety standards. The latest deadly blaze to hit Bangladesh's congested capital tore through the 22-storey FR Tower on Thursday, leaving some of the hundreds trapped inside screaming for help as horrified onlookers massed outside. Police said they had detained two men, S.M.H.I. Faruque and Tasvir Ul Islam - who is district leader of the opposition Bangladesh Nationalist Party (BNP) - in the capital, after filing charges against them for criminal negligence. "We arrested Faruque just after midnight. He is the 45 per cent owner of the building. He also owns the land on which the building was constructed," deputy commissioner Mashiur Rahman told AFP. Senior police official Shahjahan Saju told AFP that Islam, who contested the parliamentary election in December and lost, was arrested at 11pm (1700 GMT) Saturday over allegations he owns part of the FR building - which authorities have said was extended illegally and lacked adequate fire safety measures. Police said they were also looking for the owner of the construction firm which built the tower in the 1990s. Some of those stuck inside the burning building, in the upmarket Banani commercial district, made it to safety by sliding down cables on the side of the building, but others took their chances and jumped in a bid to escape the smoke and heat. Six people leaped to their deaths. Firefighters backed by military specialists - some in helicopters - tackled the flames, lowering ropes to help people escape, while rescuers on long ladders smashed through windows. The arrests came as a senior minister called the fire an act of murder amid growing public clamour for better building safety standards. Authorities have ordered an investigation into safety measures at the tower. Fire officials said the blaze-hit building lacked fire exits and sprinklers, while access to its emergency staircase was padlocked. The city's housing authority later said five upper floors in the building were illegally added without official permission. According to a 2012 study by Bangladesh University of Engineering and Technology, most high-rise buildings in 15-million-strong Dhaka have inadequate fire safety measures. Experts said inspections of buildings in the city frequently found fire stairs blocked with stored goods and exit doors locked.